If you are anything like me, you probably have several tackle boxes full of every type of lure about which you have ever curious. From spinners to plastic worms to poppers to jigs I have them all. However, there is just a handful that I use on a regular basis, and they cover about every type of fish I target. While variety has its benefits, so does simplicity. More and more I have trimmed back my gear and pack light when I head to the river, lake, or pond. I just take the lures that I feel give me the best bet of catching fish along with possibly some live bait. 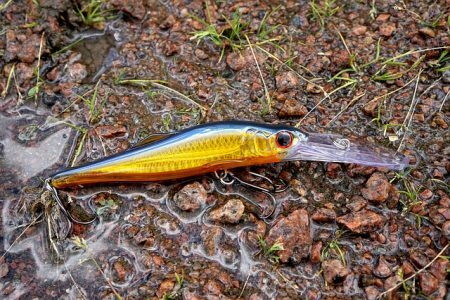 In this article, I will discuss the artificial lures that I feel give you the best bet of catching any freshwater fish. 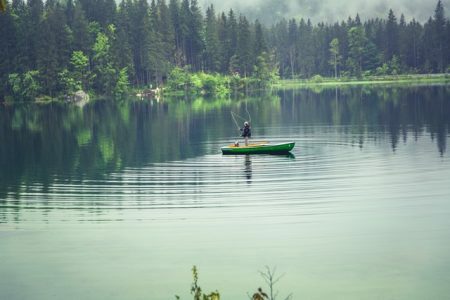 I hope it may allow you to simplify your fishing gear or possibly try a new option you have never tried before. My favorite freshwater fish to target are largemouth bass, and my favorite artificial lure to use is the classic plastic worm. 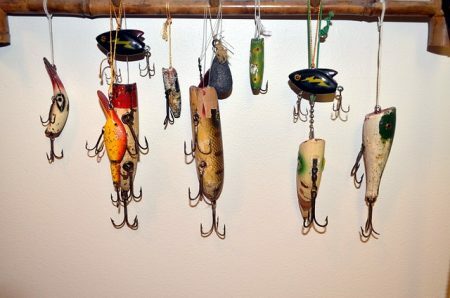 This is one of the oldest artificial lures around, and I cannot seem to find anything better for the large pond on our property. The water in our pond is fairly muddy and has a good amount of algae for part of the year. I also fish mainly mornings and evenings, so I go with a darker pumpkin color and like using the Yum brand. For a good hook set, I use a Texas rig and like to have only about two to three inches of tail below the hook. Because of this, I sometimes tear off part of the worm for a better length. When a largemouth hits this lure, they hold on and give you a chance to set the hook well. The average fish I catch in our pond is about five pounds, so they do their job well. I have no interest in catching smaller fish that I will have to throw back. Specifically, the Heddon Zara Spook was created in 1939 and is still a great option today. This design has a hollow body along with two treble hooks and typically a light color such as bone. The key to its effectiveness is the side-to-side jerking action you get as you retrieve the lure. This is almost irresistible to any fish that will strike food on the surface such as bass, muskies, trout, and tarpon. I have also used a popper version that gives you noise along with the aggressive motion that attracts fish. I find these lures work best early in the morning or late in the evening. The spoon design has been around since the early 1800’s. The metallic flicker that you get as the spoon flips back and forth imitates the shimmer you see off of the surface of a minnow. A simple treble hook is attached, and you are good to go. A small spoon like a 1/8 ounce Acme Little Cleo is a good choice for trout and can be cast upstream and then retrieved across the current. Several colors are available, but classic gold works well and is practically indestructible. This design is similar to a plastic worm but smaller. A good section of the body is replaced with a curly tail that goes crazy as it is retrieved or pulled through current. These lures work well on bass, or you can catch your fill of sunfish if you go with the smallest version. You can also add a grub to any rig that creates more motion or sound for an even better effect. Use bright colors in good sunlight and darker colors in muddy water or low light. This lure was created in 1936 and is probably responsible for more fishing records than any other lure. It is made of balsa wood which helps it float and gives it a panicked action. It has two treble hooks and a medium sized lip that helps it dip just below the surface. This action and the silver color imitate an injured minnow that would make a good meal for just about any fish that feeds off of the surface. The jig is a weighted hook design that is made for fishing on or close to the bottom. The hair jig adds hair to help hide the hook and give it a more fluid motion in the water. The shape of the head drastically affects the motion you get from this lure. A football shape is best for rocky areas while a bullet shaped head is good for dragging through grass or other plant matter. If you plan to be in the water with little debris for snags, the line tie should be on top of the head for a standard retrieval. Crappie is my favorite fish for jigs, but any bottom feeder will go after one. This design is probably the most recent to be developed and is about 40 years old. Its plastic body is an exact replica of a threadfin shad, and the boot-shaped tail gives it a realistic swimming action. You can buzz it across the surface, or bounce it over submerged rock piles and trees. Bass and catfish are two that love this lure. I hope we have given you some insight into the most popular lures loved by both fish and anglers alike. If you have not tried one of these designs, spend a few dollars and give it a shot. If you are like me and have more lures than you will ever need, consider simplifying your arsenal next time.